A record number of prospectors are scouring scores of sites across the East Midlands, Yorkshire and a swathe of southern England. The dizzying rise in oil prices over the past year to above $147 a barrel has made even the smallest pockets of oil and gas commercially viable. 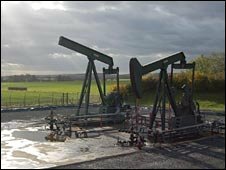 Environmentalists fear drilling for oil will ruin some of Britain's most beautiful landscapes but the government and oil companies say that it will help secure the UK's energy supplies amid a global grab for oil. "Indigenous resources are becoming more important for security of supply," says Mark Abbott, managing director of Egdon Resources, an exploration and production firm that operates an oil field in the Lincolnshire Wolds. In May, the government awarded a record 97 new licences to 54 applicants for onshore oil and gas exploration. Five years ago, only eight licences were granted. Hampshire-based Egdon Resources obtained six of those licences, allowing the firm to prospect for oil and gas in Dorset and the East Midlands. Mr Abbott says a typical UK oil field will contain one million to 10 million barrels of oil. "It's not Saudi Arabia or even the North Sea. "But if we find oil, it's quick and easy to put in small, low-key production facilities and then tanker the oil out to refineries," he says. The company has proven reserves of one million barrels of oil - worth around $118m (£63m) at today's prices and nine million barrels of "contingent reserves" - reserves that in the company's opinion have a more than 50% chance of production. Despite the potential bonanza it's a tough business. The firm, which was established in 1997, is loss making and only saw its first sustained oil production in the second half of last year. Total revenues from oil sales in the six months to January 31 totalled £758,000. "It's a prolonged process - developing the ideas, applying for the licences and finding partners. The first three or four years we were quite resource constrained." The UK has a long history of oil production. Onshore drilling in the East Midlands proved vital to the war effort during World War I and the discovery of oil and gas in the North Sea in the late 1960s allowed the UK to become largely self-sufficient in the two resources. But this is changing. The UK became a net importer of gas in 2004 and is expected to become a net importer of oil by 2010 as production in the North Sea declines from its 1999 peak of about 2.9 million barrels a day. Building and maintaining offshore platforms is costly and as fields mature there are fears that the return will no longer be enough to cover costs and make big profits. Drilling onshore costs a tenth of the £10 million to £20 million needed to drill an offshore exploration well, making even small reserves of oil highly profitable at today's high prices, says Egdon's Mr Abbott. "We can operate at $30 to $35 a barrel (of crude). Offshore, only the biggest companies could operate at that level," he says. The government is keen to encourage companies like Egdon to exploit the UK's energy resources. 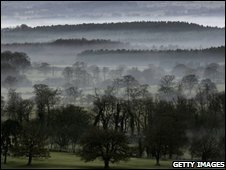 The biggest onshore oil field is BP's Wytch Farm in Dorset. It produced 7.6 million barrels of oil last year, around 85% of the UK's total onshore production. "The era of cheap energy is well and truly dead and therefore Britain would do well to get its energy from sensible places and think imaginatively about where those places might be," Energy Minister Malcolm Wicks told BBC's Newsnight. "There is a huge global grab for energy going on. We've got to make sure that Britain is protected; that we have the energy we need." Energy companies, which must pay an additional 20% levy on top of corporation tax, are also big contributors to the Treasury's coffers. According to industry group UK Oil and Gas, the sector paid £7.8bn in taxes in the 2007-2008 financial year and this is forecast to jump to between £12.5bn and £16.5bn next year depending on the direction of oil prices. But not everyone shares the government's enthusiasm for exploiting the UK's resources. 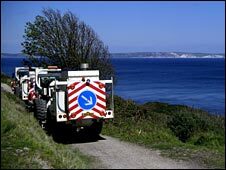 Environmental groups have been angered by West Sussex County Council's decision to give permission to Northern Petroleum to drill an exploration well near Chichester. "Drilling for oil isn't compatible with a place that should be for quiet contemplation and getting away from urban life." Northern Petroleum says that it will minimise the environmental impact and stresses the economic benefits of oil production. "It is our opinion that 100 million barrels of oil or even more is recoverable from the UK South of England alone, possibly more," the company says. "This would be advantageous to the country, not just for the creation of jobs in the haulage and service maintenance sector for example, but also... in adding a large amount to the chancellor's purse and reducing the UK's energy deficit." Industry experts say fears of a Dallas-style oil boom in the UK are overstated given the small size of onshore reserves. The UK has just 0.3% of the world's proven oil reserves and the lion's share of these are still under the North Sea. But while oil prices remain above $100 a barrel, it seems certain that nodding donkeys and drilling rigs will become more commonplace among Britain's hedgerows, coppices and wheat fields.